What Makes a Good Pot Roast? An old favorite, pot roast, is just a chunk of meat cooked in a pot. The actual process is braising; that is, cooking in a limited amount of liquid. If you use a lot of liquid you are boiling. My method of making pot roast is using a combination of braising and steaming. This method guarantees tenderness of anything you cook. The good old American pot roast is beef with potatoes, onions and carrots. This recipe can be modified in many ways to suit the individual cook preparing it. The cabbage creates the perfect cooking liquid. Season the roast on all sides with Lawry's Seasoned Salt. Coat the roast with flour and brown in a little oil on all sides in a large pot or deep skillet with tight fitting lid. When the roast is brown, layer on the bell pepper and onion. It is important that the pepper and onion go on first. Add the rest of the vegetables on and around the roast. Give a light sprinkle of Lawry's. Put the lid on and turn the heat down to where the pot just simmers. Don't add any liquid, since when you put the top on, liquid will begin to flow from the vegetables. Check occasionally to retain the simmer. After about two hours, the dish should be done. The rule is, when the carrots are tender, everything is done. You can simmer it longer to fit your schedule. After about two and a half or three hours everything begins to turn to mush, so be warned. When it is done, fish out the meat and place it on a serving dish, spoon the vegetables into a bowl for the table. Or you can load the plates at the stove. A great by product of pot roast is hash. You can refrigerate leftovers overnight and, the next day or so, cut everything into small pieces and warm it gently. It will make very good beef hash. Use leftover pot roast to make hash. You can use other than Lawry's to season the dish. But it won't be as good. 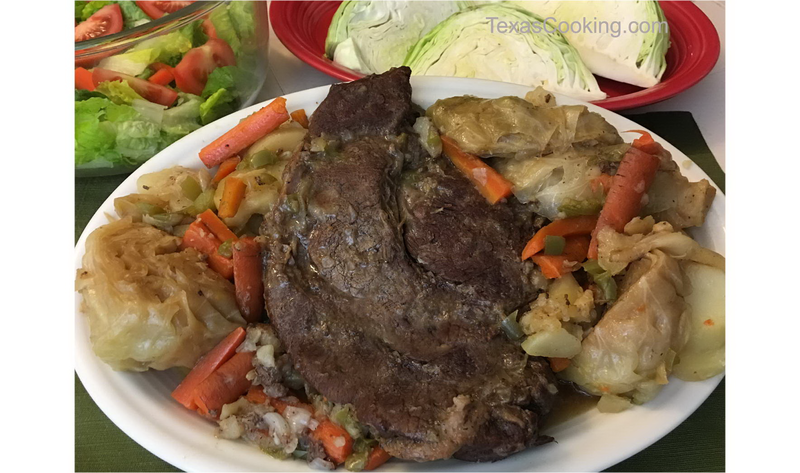 I have prepared pot roast in the above manner using beef brisket, beef hamburger formed into patties, pork chops, sausage, venison roast and chicken parts. All were very good. The smaller cuts will cook quicker than the large, so take that into consideration. As I said before, if your carrots are tender, everything is done. In addition to the listed vegetables, I like turnips and sweet potatoes. If you can find onions about as big as golf balls they would be great in taste and appearance. Half a red bell pepper cut into half-inch squares would really improve the appearance. If you find yourself pressed for time and have to be away from the kitchen for a few hours, the crock pot will turn out a fine pot roast. You do have to brown the meat before putting it in the crock pot. Then load the vegetables, turn the heat on low and come back in 9 or 10 hours to perfection. If you use the high setting on the cooker, the cooking time will be about 4 or 5 hours. With either cooking method, you are going to end up with a large amount of juice from your pot roast. Now these are natural juices, since you have added no water. Most of the liquid comes from the onions and cabbage, if you have used them. As I said earlier, the leftover pot roast, if there is any, can be converted into a fine hash just by chopping up the leftover meat and vegetables. Or you can warm up any leftovers and serve as is. This sauce is great on leftover pot roast. Combine all ingredients in saucepan and simmer 25 minutes. Purée in blender. Makes 5 cups. This sauce is also great on barbecued or grilled chicken and pork. Always serve it warm. It just tastes better that way. We're outta time, but tune in next month at the same location on your dial for more Texas Cooking.